Somehow time has been flying by, and I’ve been neglecting this blog… Not sure whether it’s because I’ve been extremely busy at work, or because I don’t have quite so much to say about India these days. Possibly both. Anyway, Monsoon is over and now it’s Autumn. Sort of. A couple of weeks back, Monday morning was suddenly cooler and slightly hazy. The day-time maximum is now less than 30 degrees every day, and overnight it’s comfortably below 20 and falling by a degree every 2-3 days now. Being able to manage without air conditioning on overnight means getting a much better night’s sleep, which is very welcome. 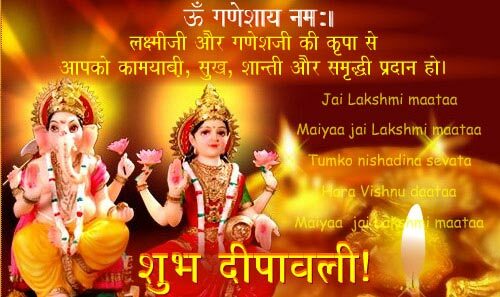 It began yesterday with Dhanteras, and tomorrow will be the main day of celebrations with Hindu families celebrating Laxmi Puja. The tiny diya oil lamps will be lit around people’s homes, and Ganesha and Laxmi (see above) will be worshipped. Fireworks are now going off constantly outside, houses are festooned with coloured lights all over the outside, the shops are overflowing with hampers and sweets and dried fruits. Lots of people are shopping and visiting family. It’s a happy time. I gave Rs 20 to a beggar with one arm today, and he beamed and wished me “Happy Diwali!”. The atmosphere at work became very relaxed and jolly towards the end of this week, with lots of smiles, gifts and celebrations. Everyone is looking forward to spending time with their families, and taking a week off next week. As for me, tomorrow I’m heading to Nepal for the week. And I’m really looking forward to finally seeing some of the Himalayas.